Natasha was visiting Chicago from Asheville, North Carolina when she paid the studio/shop a visit. She has a beautiful moissanite engagement ring that she didn't want to resize while she was pregnant. We discussed the options for an alternative engagement ring for her pregnancy that she could wear on her other hand later. 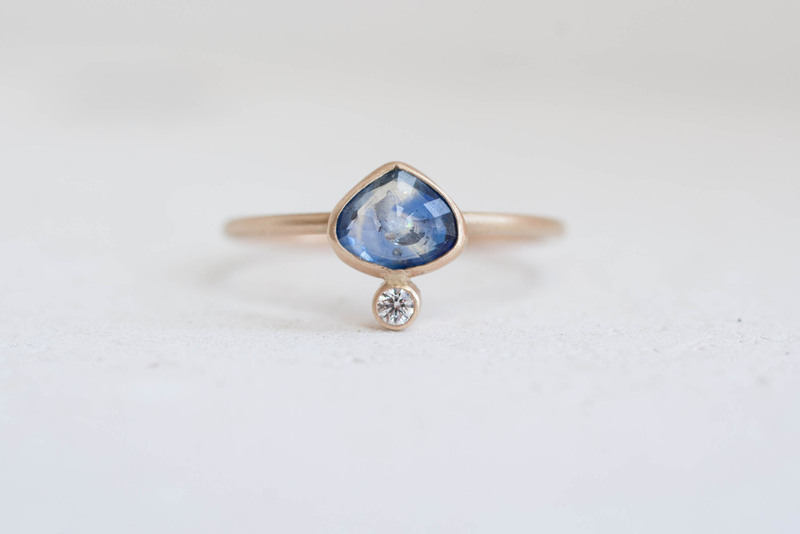 After looking through my custom stone selection, she settled on this beautiful, one of a kind sapphire. It was especially fitting, as she is expecting a baby boy in September, whose birthstone is sapphire. I set the sapphire in 14k recycled gold in a brushed matte finish and accented it with a conflict free white diamond. Thank you Natasha, it was wonderful creating this ring for you! Happy pregnancy while you await the arrival of your little boy!